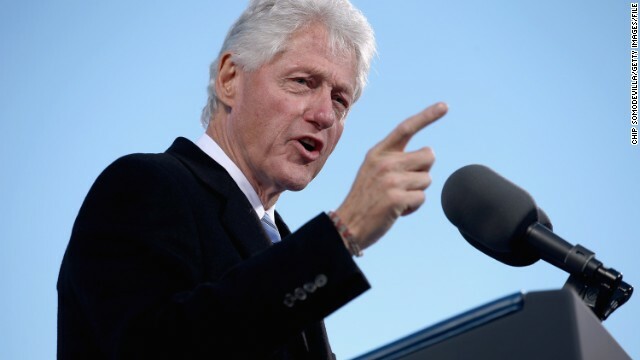 Washington (CNN) – With the vast majority of African leaders in town for a White House summit on the future of the continent, former President Bill Clinton said Tuesday that partnering with African business is a "massive opportunity for American business." "We are missing the boat," Clinton said. "This is a very important part of our future." Clinton's comments are part of a concerted effort by U.S. leaders and politicians to court African business and herald the continent's progress at the summit. President Barack Obama has been at the forefront of that pitch, telling reporters on Friday that "the importance of this for America needs to be understood." He later added that Africa "happens to be one of the continents where America is most popular and people feel a real affinity for our way of life." The pitch to Africa is more than just an economic relationship with the United States. Obama and other U.S. officials have said the United States needs to help Africa grow and benefit from ongoing progress. In an opinion-editorial for the McClatchy newspaper group on Tuesday, Obama argued that the United States has a "moral obligation" to support Africa's progress. Though Obama acknowledged the fact that "millions of Africans still endure the daily misery of grinding poverty, violent conflicts and the injustice of hunger and disease," he wrote that the United States "can’t lose sight of the extraordinary promise of Africa." "And just as Africa is changing, we need to change the way we think about the continent, put aside old stereotypes and respond to Africans’ desire for a partnership of equals where Africans take the lead in their own development," Obama wrote. The push comes at a strategically important time for the United States in Africa, given the fact that China has imported massive amounts of oil and minerals from the continent in the past 20 years. In an interview with The Economist published last week, Obama recognized that fact. This week's conference is partly a pitch to counter China's rising influence. "My advice to African leaders is to make sure that if, in fact, China is putting in roads and bridges, number one, that they're hiring African workers, number two, that the roads don't just lead from the mine to the port to Shanghai, but that there's an ability for the African governments to shape how this infrastructure is going to benefit them in the long term," Obama told The Economist. Despite the positive tone of Clinton's opening roundtable – where business leaders heralded the opportunity for investment in Africa – a number of negative narratives also hang over this week’s summit. Ebola has killed more than 700 people in three African nations: Guinea, Liberia and Sierra Leone. World health officials worry that the outbreak of the deadly disease could continue to get worse. Leaders from two nations – Liberia and Sierra Leone – cancelled their trip to Washington because of the health scare. The Ebola outbreak has affected the conference on a practical level, too: Conference-goers who might have been exposed to the virus in their home country are being screened upon arrival to the United States. The conference also plans to address growing political extremism on the African continent, where insurgents have overwhelmed some government forces, and created significant barriers to investment. In addition to Clinton, Obama and Vice President Joe Biden will address the conference at the Mandarin Oriental Hotel in Washington, D.C.
– CNN's Kevin Liptak contributed to this report. @Rudy-Rates are very misleading. If you have a small state or city in population just a few incidents could make the rate high. Example, Washington D.C. had the highest murder rate in 2010. Btw, NY was 6th in incidents of gun violence. Nigeria needs American tech in the power sector. ..there also the rail transport, agric, etc. However beware of CORRUPTION AND BAD MGT. It is true, bringing all the worlds countries under the cloak of growth and progress is a great thing. I have always wondered why more American investment hadn't reached Africa yet. I know there is the concern of turmoil but the opportunities are rich there. I do know, one thing will be absolutely necessary before real American investment hits that country and that is equalizing the corruption of "some" of the major Governments. Yes, yes theirs corruption in every country and that is unavoidable but the type of corruption I am speaking of, as an example Boko Haram incident in Nigeria. First 200 girls are kidnapped, then the Nigerian Govt twiddled their thumbs while refusing offers of assistance, essentially allowing Boko Haram to get away, hide and disperse the kids. Making it virtually impossible to find them. Then they accept assistance, only make it clear they will need money in order to find them. That's the type of corruption I talking about. The type of corruption that exploits innocents and vulnerable, for what appears to be personal gain and profit. Of course all done illegally and outside any bounds of ethics or morales. This is the big reason why a lot of US investors pulled out of Mexico too. Cartels, truly evil forms of corruption, these are all sticking points, at least it would be for me, if I was a foreign investor. Really Sniffit....Really? Put the Lime in the Coconut....you're such a silly woman ( or man). What are you talking about? You're making an argument against rates by making an argument that uses rates. Whoa. Rates provide some context. Raw numbers are fairly meaningless without context. This began when someone singled out cities, "Look cities are dangerous." Guess what? Some of our towns can be far, far more dangerous than our cities. To the haters, let's not forget that the shrub #43 was more popular in Africa than he was in his own country. "@ Rudy NYC; Ol' Yeller Not surprisingly, you're wrong. Look at ranking by city not state"
Fact is... I will concede to old age voter there is too much gun violence in ALL of our American cities. I'm even willing to discuss strategies for correcting this... problem being is that is where the conversation stops with most righties as they start screaming about 'taking away our guns' and their 'rahts'. Difference being, they want to argue about a persons 'rahts' to carry any gun, anywhere, anytime... and that is the end of the debate. They do not want to hear about other people's 'rahts' like going to movie, or the mall, or even to school without having to be shot by the nut job... who's 'rahts' seem to be the only one's they are interested in defending.